Intermediate skills are something which are in the middle i.e. in the developing stage to become an advanced skill. 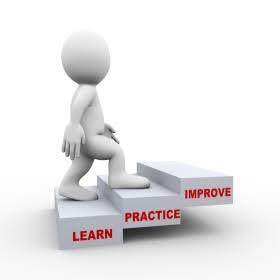 Intermediate skills are achieved through putting sufficient effort, undergoing trainings and practicing them. Intermediate skills are not easy to achieve, one needs to spend significant amount of time working on it. The person possessing intermediate skill level is assumed to have sufficient experience in working on it and also able to handle regular and routine issues and related problems. When a person starts learning a skill, in the nascent stage, the skill the person has is called an introductory skill. It is achieved easily by putting low efforts and less man hours. An introductory skill level implies that one has little or no experience. The next level is called Beginner Skill. A person with this skill level is assumed to be familiar with the basics of the process. This is achieved by observing closely, participating in the meetings as observer, working as an intern etc. The next level of skills are Intermediate Skills. The final skill level is called the advanced stage. A person having advanced skills is assumed to handle any situations related to the area. The person possessing intermediate skills would be doing or performing the roles such as, acting as an intern, but taking more active leadership roles in the team, or guiding the entry level interns, or mentoring less experienced peers under the guidance of seniors, or beginning to work in the project or along with the project architects, or beginning to engage with clients and vendors, or participating in team meetings as an active member, or reporting directly to the senior team lead etc.